I love making these felted beads. They are quick to make, easy to do and can be used in a variety of jewelry projects. They are an offshoot of my other felting experiments and a nice alternative to the more common ball-shaped bead. Put your biscuit cutter on the mat and press it slightly into the surface to keep it stable. Pull a tuft of the roving . Gently roll it into a ball shape and stuff it into your biscuit cutter. Using your needle felting tool, begin punching down the roving. Move from the center to the edge of the circle and back. I hold the biscuit cutter with one hand while punching with the other. (In the case of this photo, I was using my left hand to take the photo!) Once you have a fairly uniform surface, lift up the biscuit cutter and flip it over and felt from the other side using the same process. Continue until the bead is flat like a pancake and about 1/4 inch thick.. Remove the biscuit cutter form. Hold the bead in place with the claw in one hand and continue felting with the tool along the edge of the bead to firm up the sides. When the bead feels dense and firm, pull a thin tuft of a contrasting color and lay it across the surface. 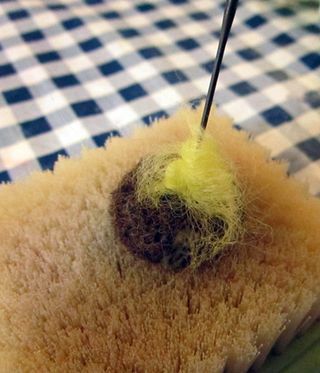 Remove one of the needles from the needle felting tool. Punch down in the center of the tuft to begin attaching it to the bead. Twirl the tuft of roving around the needle and continue punching it into place. It will soon form a dot. Continue punching around the edge until the dot it is round and dense. You now have a bead! You may add another dot to the flip side if you wish. Glue your new creation on a pin. Thread it onto a cord. Add it to a jacket zipper. There are many possibilities! Mom's favorite holiday was Christmas. She started getting ready in July and by late September all her presents were wrapped and packaged to send. Though it seems a bit crazy to get started so early, the holidays were the busiest time with her catering company. The only way she could have the energy to enjoy the season was to be prepared. For years I was the family holiday humbug, but as you can see, I've changed my tune. This table top decoration is an easy weekend project that's fun to do, unlike raking leaves and painting the trim around the windows. Leave those projects for another time. 1 3" each of assorted colors of wool roving - orange, pink, lavender, deep rose, red, blue, navy, forest green, magenta. Place the cone on the green flat sheet of felt and carefully trace the base. Cut out the circle and set aside. Loosely pull apart the kelly green roving and wrap around the cone, setting aside at least 10inches. Do not do the base. Using the larger needle felting tool with 5 needles, begin felting the wool. Move your needles across the surface to adhere the roving to the cone without crushing it. If you stay too long in one place, you risk weakening the foam base. Check for bare or thin spots and fill in with extra roving. Pull apart the remaining roving (approximately 4") and roll into a loose log shape. Place one edge of the log onto the mat and use the pen tool to begin felting a point. This will be the top of your tree. Continue shaping, turning the work as you go for even felting to develop. Leave tails at the base to allow you to attach to the cone. Once it is fully formed, place ontop of the cone and felt into place. You may need to add a little more roving at the join to fully adhere it and cover and thin spots. The tip of your tree will feel softer and squishier than the base as there is no foam inside. Pull a small tuft of colored roving. Place it on your mat. Use one loose needle and twirl it onto your needle. Needle felt it onto the cone. For dimension of the dot, focus more of you needle felting along the edges rather than the center. Continue adding more dots of color around the surface of the tree, leaving the bottom and very tip empty. Place the star miniature cookie cutter on the mat. Fill it with cream roving. Use the pen tool to felt it. Use a loose needle to continue along the edges where the pen tool can't reach. Remove the cutter. Turn the star on its edge and use a loose needle to finish shaping. Glue the felt circle to the base of the cone. Carefully trim off any overlap. Add a pinch of glue to the base of the star. Stick the hat pin through the top and place on the tip of the tree. Once the glue has dried, you may remove the pin or leave as added decoration.